Join us in the Gallery for our monthly general meeting. Learn about upcoming events. Pizza and drinks will be provided. Join our Freedom By Design branch for a design exercise. Our annual bake sale starts at 8:00am and goes until sell out! Free coffee with a purchase. With each purchase, your name will be entered into our raffle. Information on licensure and root beer floats! Get to know your fellow members over lunch! Nachos will be provided. See a board member for more information. 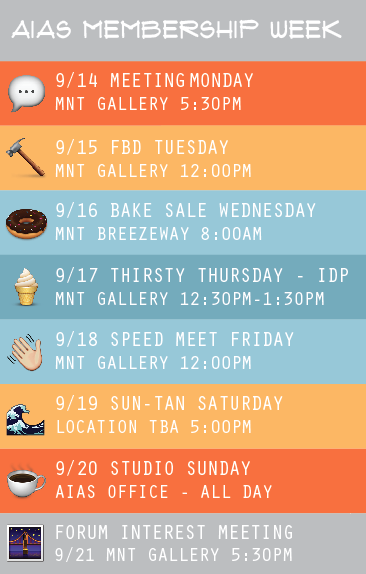 Come hang out with AIAS in our office located in the freshman studio. Coffee will be provided.